The Islamic State is one of the most lethal and successful jihadist groups in modern history, surpassing even al-Qaeda. Thousands of its followers have marched across Syria and Iraq, subjugating millions, enslaving women, beheading captives, and daring anyone to stop them. Thousands more have spread terror beyond the Middle East under the Islamic State's black flag. How did the Islamic State attract so many followers and conquer so much land? By being more ruthless, more apocalyptic, and more devoted to state-building than its competitors. The shrewd leaders of the Islamic State combined two of the most powerful yet contradictory ideas in Islam-the return of the Islamic Empire and the end of the world-into a mission and a message that shapes its strategy and inspires its army of zealous fighters. They have defied conventional thinking about how to wage wars and win recruits. Even if the Islamic State is defeated, jihadist terrorism will never be the same. 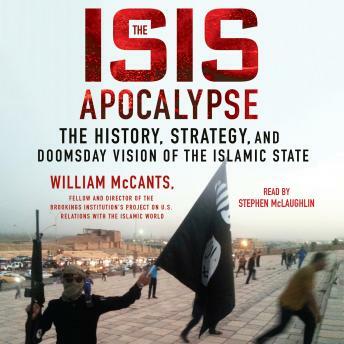 Based almost entirely on primary sources in Arabic-including ancient religious texts and secret al-Qaeda and Islamic State letters that few have seen - William McCants' The ISIS Apocalypse explores how religious fervor, strategic calculation, and doomsday prophecy shaped the Islamic State's past and foreshadow its dark future. Solid but not spectacular. Excessively detailed in tangential areas. Very informative and well read. Gives a great insight in how this organisation came to be. The narrator didn't annoy me which is all I can ask for! I'm listening for the second time now and I will probably want to read some more about the subject.